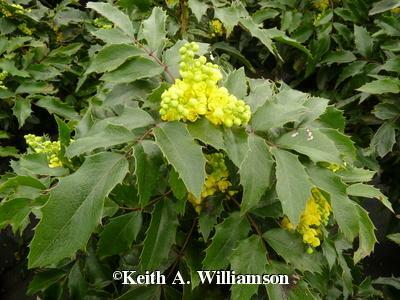 Compact Oregon Grape Holly is the February 2018 Plant of the Month – Glacier View Landscape and Design, Inc.
Mahonia Aquifolium ‘Compacta’ is a popular landscape plant for shady or wooded settings along the Front Range of Colorado. 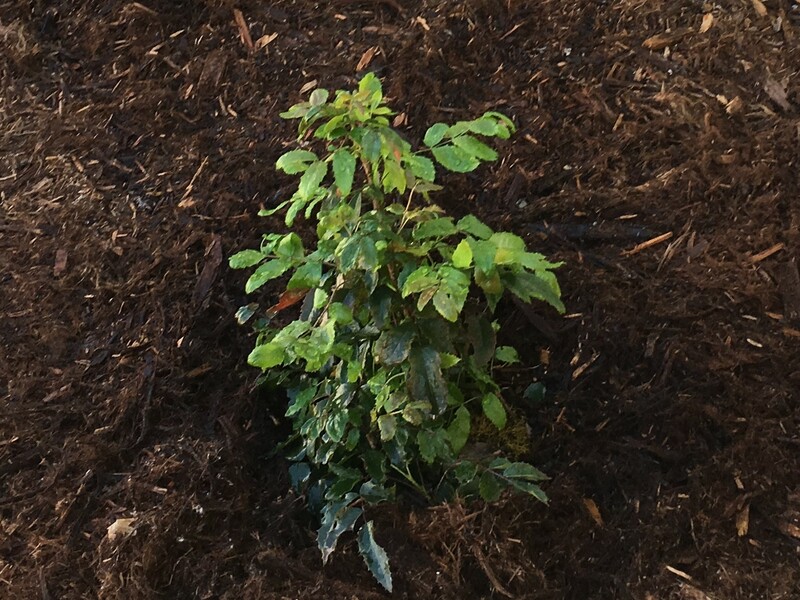 It does well in our Longmont, Colorado landscapes and requires little maintenance. It is not particular about soils, requires minimal watering once established, and maintains an evergreen appearance throughout the winter months. There are several cultivars of the standard of the species, and the compact holly merely allows it to thrive in tighter locations. Growing 2’-3’ high and wide, it will thrive in shady locations, north sides of buildings or fences, under the canopy of larger trees and shrubs, and just about anywhere that it will not get direct full sunlight for more than a couple hours per day. The leathery green leaves are stiff and have slightly sharp spines on them that can make them unpleasant to grab ahold of, especially when desiccated during the winter months. New, spring growth is softer and lighter green, with leaves turning a darker green over the course of the summer months. Spring flowers are bright yellow and small, not showy, but attractive. Berries adorn the shrub in the fall months, and birds like them. The berries are not toxic, and were used by aboriginal people of the Pacific Northwest where the plant is native to. The plants range extends into Colorado and New Mexico, California to Alaska in its native form where it is often found under the canopy of Douglas Fir trees. Often planted in groupings in Colorado landscapes, this holly will create an evergreen backdrop for other seasonal perennials, and thrives under coniferous evergreens where other species often struggle. Experiment with them in your yard for evergreen color and texture. They work great as foundation plantings.